If you just came from Paulas super cute blog you are in the right place! If not click HERE to start at the beginning! Its all about spring today!! When I think Spring I think of CLEANING!! Yep that's right I said it!. This card was made with scraps I had, in spring colors ! And this is the biggest Oh My of all..... I didn't use my Cricut!!! I cant believe it either, My first card with no Cricut and my first try at these flowers. 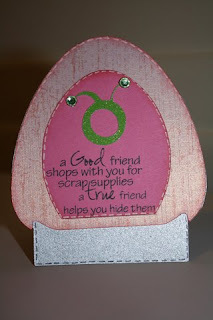 Supplies used: Martha Stewart punches and a Pink by Design sentiment stamp! Your next stop on the hop is................. RACHEL !!!!! This is my last week designing for the FCCB, I have so much going on I felt I could not give it all it deserved. So this weeks challenge is to make a shape card! I used the new circle exclusive cartridge Cricut Everyday to create the cartridge card and the circle logo. I also used Pink by Design sentiment stamps "Crop till you drop"
My very first spinner card...and yes I'm loving them! When you tilt the card the bird spins from one side of the card to the next! I used Create a Critter, Mini Monograms or a punch, and you can cut the card and hole by hand or use your gypsy with any cart that has a rectangle and adjust the size! 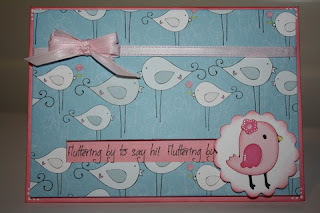 I also used Pink by design sentiment stamp...it says..."Fluttering by to say hi"
This week at the FCCB the challenge is to create anything with any part embossed. 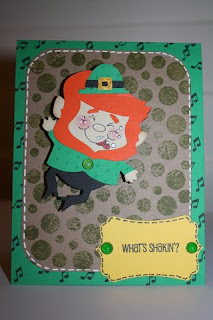 I made a leprechaun card and of course he WOBBLES from Simply Charmed!!! I also used Pink by Design bubble background stamp, Rock on stamp set for the music note and the 50's set for the sentiment! Also Peachy Keen Happy New Year face stamp !! *** This will also be one of the cards we will make in Cricut class this Saturday. If your interested please email me, classes are held in Northern California !!! Thats right a NEW month/holiday means a new creation on my Cricut Wall !!! Whoo hoo. SO I put together a short little video showing you up close and the stamping I did on the vinyl with Pink by Design stamps and background stamps !!! Thanks for everyone who stopped by my blog for the Valentines Day blog hop! I featured Cri-Kits gel pens and had a special code you can STILL use!!! Its SBUG10 so go get some cool pens! Next on the hop is Giselle's sweet blog !! Winner of the Lots of Love blog hop!!!! Thank You for everyone who checked out my Dog Valentine treat bags for my daughters class. This hop was sponsored by Kathy from http://www.smartbuygal.com/ she graciously donated a $25 gift certificate to one lucky follower !!! A BIG thank you to Kathy, she has a wonderful store check her out online !!! Thank you for sharing this, Michelle! I'm definitely going to be making some of these! Thanks for sharing. If you hopped from Leinad's blog you are in the right place !!!! I decided to make shirts for my girls. My daughter has been begging me for a shirt with a bug head on it so I finally made her one with my YUDU. 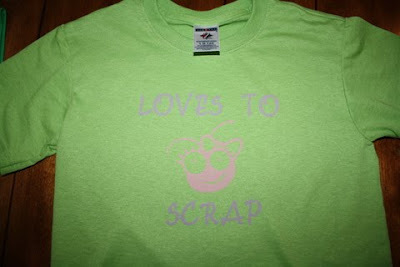 Below is a video on how I made this shirt using vinyl instead of the emulsion process. I also explain how you can use vinyl as a stencil for shirts if you dont have a YUDU. I have created 30 of these super cute treat holders for my daughters Valentines !!!! She absolutely LOVES dogs so of course it has a dog! I have made a quick video on how you can make them as well !!!! BLOG CANDY???? Who said Blog candy??? Please take the time to follow my blog and leave a comment and I will pick a winner for a $25 gift certificate to http://www.smartbuygal.com/ !!! I have ordered from Kathy and she is sooo nice and has fast shipping (my last order shipped the same day!!) hows that for fast? I used Everyday paper dolls, Peachy Keen Critter face stamps, Martha Stewart Punches, and a Pink by Design sentiment stamp! Sneak Peaks of tonights release !! Hi Everyone! This is my first week designing for Pink By Design!!! I have a few sneak peaks of tonights new stamp release. Both of these sentiments are on the same set...and I must say I LOVE it !!! This one is made with Twinkle Toes, and Stamping Cricut cartridges, Divine Swirls Cuttlebug and of course a PBD Sentiment, along with Stickles, twine, and PK face stamps !! It says "Friends make life Bear-able"
This cute little tag is from ZooBalloo, Create a Critter and Mini Monograms along with a PBD stamp, Bakers twine, Peachy Keen stamp and a wobble !! So I made treat bags and incorporated 3 challenges into it. Peachy Keen stamps- Needed to have a XOXO on the project. 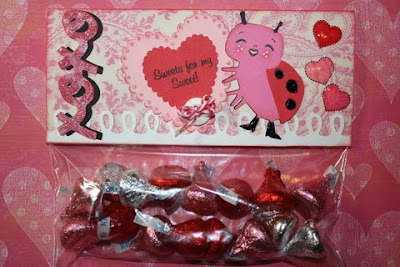 I used Peachy Keen Valentine stamps (the hearts and the sentiment) also the Princess set face stamp. The other challenge was for the Circle blog, I needed at least 4 cuts. For this cute bag I used Sweethearts, Martha Stewart Elegant Cake, Wrap it Up, and Paisley cartridges. I also used glossy accents, Bakers twine from the Twinery, a button and Stickles !